On Tuesday, August 9, 2016, the Turkish President Recep Tayyip Erdogan arrived in St. Petersburg to hold talks with the Russian President Vladimir Putin. This was Erdogan's first foreign visit since the July 15 abortive coup against his elected government. St. Petersburg is Putin's hometown. Addressing a joint press conference after the talk, Putin said: "I believe that we have all the necessary prerequisites and opportunities for restoring our relations between our two countries to the full extent and Russia is ready and willing to do that." On his part, Erdogan said: "As a result of the negotiation we had today, political, cultural and economic relations between Russia and Turkey can finally be restored to the appropriate level we used to enjoy before the crisis." Ties between the two countries have been acrimonious since November last year when Turkey, citing a brief violation of its airspace along Turkey's border with Syria, shot down a Russian military aircraft. Russia's President Vladimir Putting ordered punishing economic sanctions, imposed a travel ban on Russian tourists visiting Turkey and suspended all government-to-government relations. Unable to ignore the damage, Erdogan conveyed regrets to Putin; the regrets were accepted which paved the way for August 9 meeting. Interestingly, the two Turkish Air Force pilots linked to the downing of the Russian Su-24 bomber have been detained in connection with the recent failed coup attempt in Turkey, according to Turkish Justice Minister Bekir Bozdag. Erdogan also outlined a list of areas of cooperation where Ankara is eager to engage in cooperation. 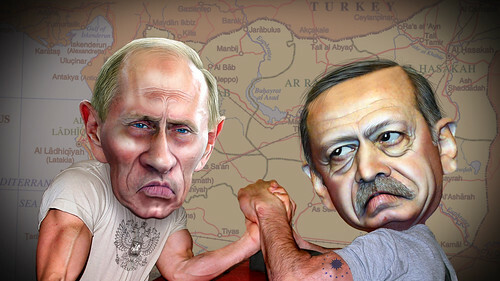 Ironically, Erdagon and Putin did not discuss the thorny Syrian issue. "During today negotiations we didn't discuss situation in Syria," Recep Tayyip Erdogan said answering the question from journalists. Vladimir Putin has also confirmed, that the Syrian crisis will be discussed later. "We believe that the Syrian crisis can be resolved only through diplomatic decision," he noted. "We have experienced many challenges in our relations recently, but we should restore our relations on pre-crisis level for citizens' sake," President Putin said in conclusion.